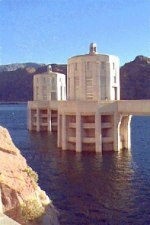 Two of four reinforced-concrete intake towers located above the Hoover Dam. There are two towers on each side of the canyon. The towers are 82 feet in diameter at the base, 63 feet 3 inches in diameter at the top, and 29 feet 8 inches in diameter inside. Each tower is 395 feet high and each controls one-fourth the supply of water flowing from Lake Mead for the power plant turbines. Built between 1931-1936, the dam was considered both an engineering and an artistic achievement. The dam generates an average of 4.5 billion kilowatt hours of electricity annually, serving the needs of nearly 8 million people in Arizona, southern California, and southern Nevada. At the moment, water is Lake Mead behind the dam is very low. The depth can reach as high as the open spaces in the top of the intake towers. Massive towers, massive project…well illustrated by you. Wow, Marie! This is a great photo of the towers. Thanks. It is a fascinating structure.